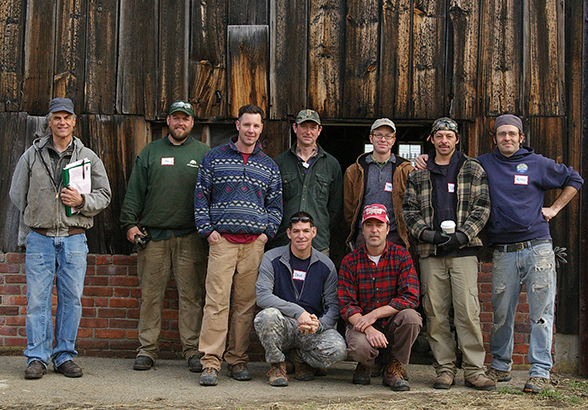 The Stone Trust provides access to and administers the Dry Stone Walling Association’s certifications at its Center in Dummerston VT. The certifications consists of four certified levels: Initial, Intermediate, Advanced, and Master Craftsman. They are designed to ensure that dry stone wallers achieve the highest standards of craftsmanship. The difference in standards for dry stone walling between good and bad work is significant. Hiring certified wallers provides a basis of quality work. The DSWA’s certifications have become the world wide standard for evaluating wallers’ proficiency and quality. The certifications began in 1968 in Great Britain as a way to evaluate a waller’s skill, promote correct structural techniques, and help clients determine the capabilities of prospective wallers. The Stone Trust administers all four levels of certification. Certification tests are hands-on demonstrations of the wallers’ capabilities. At each level the test walls are evaluated and scored by certified DSWA examiners. Tests take place at The Stone Trust Center and are offered once each spring and once each fall. Registration for each test must be submitted 6 weeks prior to the test date. Tests are available to all individuals, amateurs and professionals alike. Certification tests are rigorous and challenging at all levels. All test candidates should be familiar with the correct structural techniques involved with building a dry stone wall. Test candidates can determine what level they are ready for by familiarizing themselves with the certification levels. Many candidates benefit from taking workshops and pre-tests as a way to prepare. All levels of certification consist of taking down and rebuilding a specified amount of wall in 7 hours. The walls are built in the presence of certified examiners and must meet the minimum required score to pass. All tests are graded on a pass/fail system. Each part of the test wall is numerically graded, and must meet or exceed a minimum score to pass. The test wall as a whole must also meet a minimum score to pass. The required sections and minimum scores vary for each level of certification. See the page for each level for detailed information and example mark sheets. The 7 hour time limit does NOT include a mandatory half hour lunch break. After the test is complete The Center needs to be tidied up and you may chose to review your work with the examiners. This is in addition to the 7 hour test and often lasts 1.5 – 2 hours. Test participants must be respectful of other examinees, the examiners, and The Center. Working safely and not distracting others is important. Be sure to read the policies page. Successful Level I and II Test Candidates at The Stone Trust with Examiner Dan Snow (far left).